Club Penguin Cheats by Mimo777 Club Penguin Cheats by Mimo777: Club Penguin Puffle Party Invitation! 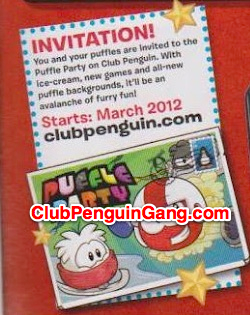 As I already told you in my What's Next 2012 post, the Club Penguin Puffle Party will be here in March! There's gonna be a avalanche I called it ! I found someone trying to be you named Mimae777, I could give you link but you would be mad! Hey Mimo! I'm not sure if it's just me, but I've noticed that my penguin looks bigger than usual in my igloo. I don't know if it's supposed to be like that or if you've already written about it, but it just looked weird to me. Hmmm. Like the previous comments with avalanche, I agree with those too. They just might mean it literally, which might lead to Card Jitsu Snow. Sorry for my obsession with Card Jitsu Snow. It's because I am so exited about it. Glad you posted the picture I sent you thanks for the Credit! Yes he had said a few things about that because if you have puffles and they wear hats on them then your bigger than normel it can even happen when you dont have puffles too. Ummm I'm sorry but Mimo posted this a long time ago.